Many of you may be feeling the excitement surrounding the build up to New York Fashion Week but lately I've been deeply in love. That's right, I've already started focusing on Valentine's Day (one of my favorite holidays!). I partnered with my fabulous sister again to promote her Etsy shop Treat ur Sweet. These are just a few sneak peek images from the shoot. We'll share the rest next week. Have a great weekend! Don't forget to enter here to win a vintage clutch! That dress is beautiful!! Such a cute shoot. Very creative. i love valentines day as well! only wish v-day was celebrated here in israel like it is in the states...great little photo shoot! The second pic is sooo cute!!! Plus I love the colors! Which lens did you use? oh! it's so super cute! I saw the one you posted on twitter and I was really looking forward to these, so fun and pretty! Love that nail polish color! What is it? That last image with the balloons is stunning! I love those SHOES! WOW. Absolutely fabulous! <3 I love that outfit! Love the dress, the shoes!! and all those red balloons! You look fab! aww what a fun photo shoot! i love the pictures Taylor! I love the table setting and heart balloons! For as cheesy as V-day is, you make it look so classy in these pictures. Don't get me wrong, I love Valentine's Day... and can't wait for the heart shaped chocolate boxes!! These photos are the best! I cannot wait until Valentine's Day. It's by far the best day of the year. My husband and I like to get dressed up and go to McDonald's for dinner (it's a rare treat I give myself). Your are so cute! Can't wait to see the rest of the post next week and how fun is it that you and your sis are doing it togehter! Adorable photos, I love the color in the dress. So so cute! And you are wearing that lovely dress! Oh my goodness. You and I must have the same taste in literature! First, the Undomestic Goddess and now this book! I'd love to see what other treasures you have stored on your bookcase. Can't wait to see the rest of the photoshoot! What is your nail color? I have been dyyyiingg for a bright red polish. I keep buying them online, but they're always too dark or TOO light. ;) you are gorgeous! love the dress! LOVE! Lol makes me want to prepare something special this year! Always good pictures !! always an inspiration, thanks. What gorgeous, inspiring photos! I love them; they're so colorful and fun. I love your blue shoes - they're absolutely beautiful. Perfect for a fun Valentine's day. These are so cute! I love all the pink and red everywhere. Valentine's Day is one of my fave holidays too. I just wish my husband shared the same view. Haha! You are so fun! And your beauty shines through in each photo. You're so cute, love it! These are gorgeous pictures. I love all the red, and your hair looks so beautiful. Hey ladies my nail polish is a cheap little LA Girls one from Forever 21--the name isn't on it, but it's a classic red. Beautiful photos! That book is one of my favorite style/fashion books. Love that dress from Modcloth! Looks great on you! Such a cute fun shoot! Is it almost fashion week again? Time flies! I just love your colorful pictures. You look absolutely stunning! And I agree with you in that I am all about Valentine's Day too. Love, love, love it all!!! I still adore those shoes, wish I had bought a pair for myself...what is the nail color, I love how cheery it is?! I love your blog! Your photos are AMAZING! i am new to the blog scene but have been thrifting for over 30 years and opened a store 2 years ago! I am so excited to have found you!!!! Thanks everyone! I'm excited to share the rest with you! Ahhhmazing photos! Love how all of the red pops! I can't wait to see the rest of the photos! The red balloons are a wonderful touch! That book looks awesome! Adore all the red and tributes to Valentine's Day. The dress is such eye candy too. What wonderful images! Perfect for Valentines day, and you look amazing! I am in LOVE with that dress - I almost bought it the other day - now Im wishing I had!! ant wait for more VDay posts! so vivid and juicy! Love it! these photos are fantastic! 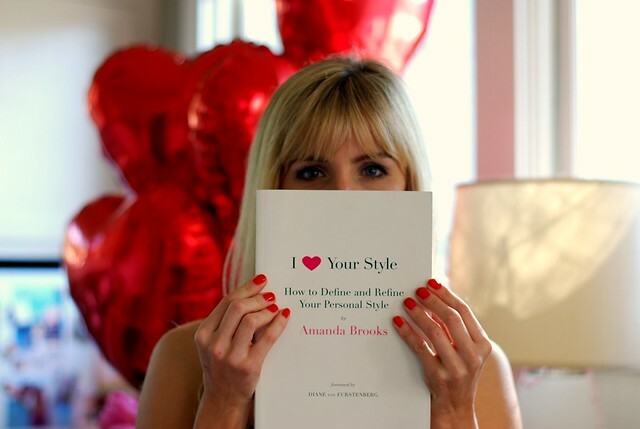 i love the book "I <3 Your Style", it's really inspirational. I am looking forward to V-day as well. These are the prettiest pictures, I absolutely love the balloons! can't wait to see the full post and shoot!!! these photos are fab! I really like your blog! gahh! LOVE your dress! what fun pics! and, of course, by "fun" i mean sincerely totally completely fabulously awesome. really.